Body image has a significant effect on many people. For women, it is a common wish to be thinner, whereas men generally wish to be bigger, specifically muscle size. Although both genders are affected by body image issues, statistics suggest that severe body image issues including eating disorders are predominantly experienced by women. This could be an indication of social pressures and relevant coping styles for trauma and stress through restrictive and suppressive behaviours. Individuals who experience body image issues frequently engage in food deprivation or restriction as well as negative thinking styles about their self-worth. This combination of negative biological and psychological behaviours can create a destructive pathway that can significantly impact health and general wellbeing. The spectrum of body image problems ranges from individuals who hold negative views about individual parts of their body to a more destructive view of judging self-worth as extremely low based on self-perception of the body. The spectrum often changes for individuals as they become more exposed to unrealistic body images amongst peers and social groups. As dissatisfaction with body image increases, an individual will eventually feel compelled to take action to change their body. This can become a precursor to an eating disorder where held beliefs about body image are further deeply ingrained. The reasons behind eating disorders and body image issues are complex. Some reasons link to family problems where an eating disorder presents as a method of controlling the chaos. This is also relevant where an individual experiences trauma within or outside of the family unit. Other reasons include social pressure from media sources and peers. Additionally, peer bullying can result in an unhealthy environment where an individual is physically or psychologically abused and uses food as a method of emotional control. This is compacted if the bullying relates to specific physical attributes of the victim. Eating disorders are considered one of the most fatal of all mental health issues due to its link with nutrition deprivation. This is a motivating factor for those who are experiencing body image issues to seek help before a more ingrained eating disorder develops. As individuals, we think using images. This is particularly relevant to how we see our physical selves and others around us. Our perception of our looks is a reflection of how we perceive others view us and how we compare ourselves to others in society. This is particularly relevant in advertising and social media as users of social media selectively curate their image to their viewers. Art therapy is especially helpful in exploring emotional distress as it facilitates a process whereby the client can connect directly with their inner most feelings and thoughts without having to filter them through verbal communication with a therapist. This is especially helpful for those clients who have experienced trauma and find it difficult to verbalise their emotional pain. There is a significant amount of shame attached to body image issues as clients often feel disgusted and embarrassed by their perceived physical flaws. This can sometimes be difficult to discuss in therapy where the client may feel silly or superficial for admitting their thighs are too big or eyelids are not shaped nicely. The client may feel more comfortable in using art as an initial method of admitting the fears they have about their body. Art therapy can play a useful part in facilitating these goals. Art therapy is highly effective for engaging in mindfulness. The activity of art making can centralise an individual’s focus on the art task at hand. Many art therapy clients report getting lost in the process of creativity where they become engrossed in following the direction their art making is taking. Acceptance and non-judgment are present in art therapy where clients get to express their personal creativity and ideas without any prescriptive expectations. Clients can choose colours, shapes, and textures within the context of personal preference. With art therapy, there is little pressure for finding the right answer to a psychological problem where a client may feel pressured to think themselves out of their problems. Clients will be less likely to become angry and frustrated at themselves when they perceive failure at being unable to change their thinking through attempts at refocusing thoughts. Summary of sessions to date: Sophia had attended a number of art therapy sessions to date which covered how she viewed her body and how she believed her body was perceived by society – not accepting. 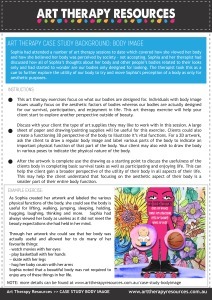 Sophia and her therapist had discussed how all of Sophia’s thoughts about her body and other people’s bodies related to their looks only and had started to wonder are our bodies only designed for looking. The therapist took this as a cue to further explore the utility of our body to try and move Sophia’s perception of a body as only for aesthetic purposes. 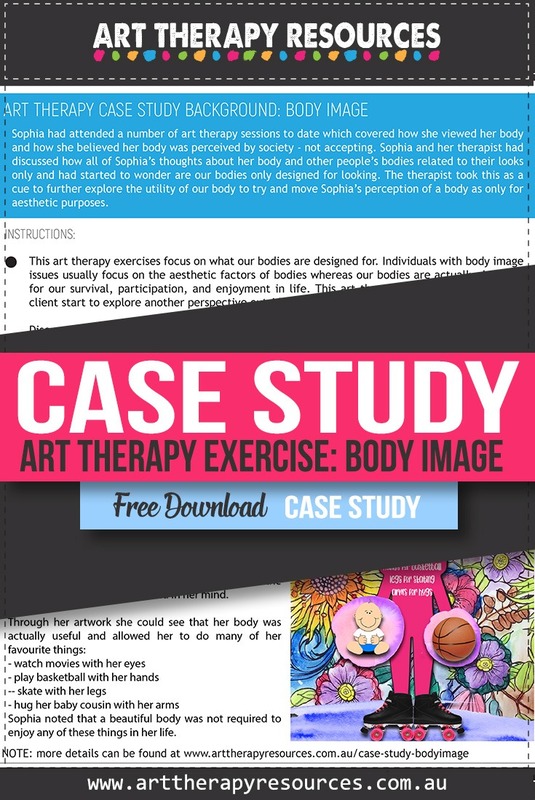 This art therapy exercises focus on what our bodies are designed for. Individuals with body image issues usually focus on the aesthetic factors of bodies whereas our bodies are actually designed for our survival, participation, and enjoyment in life. This art therapy exercise will help your client start to explore another perspective outside of beauty. Discuss with your client the type of art supplies they may like to work with in this session. A large sheet of paper and drawing/painting supplies will be useful for this exercise. Clients could also create a functioning 3D perspective of the body to illustrate it’s vital functions. For a 2D artwork, ask the client to draw a regular body image and label various parts of the body to indicate an important physical function of that part of the body. Your client may also wish to draw the body in various poses to indicate the physical nature of the body. After the artwork is complete use the drawing as a starting point to discuss the usefulness of the clients body in completing basic survival tasks as well as participating and enjoying life. This can help the client gain a broader perspective of the utility of their body in all aspects of their life. This may help the client understand that focusing on the aesthetic aspect of their body is a smaller part of their entire body function. 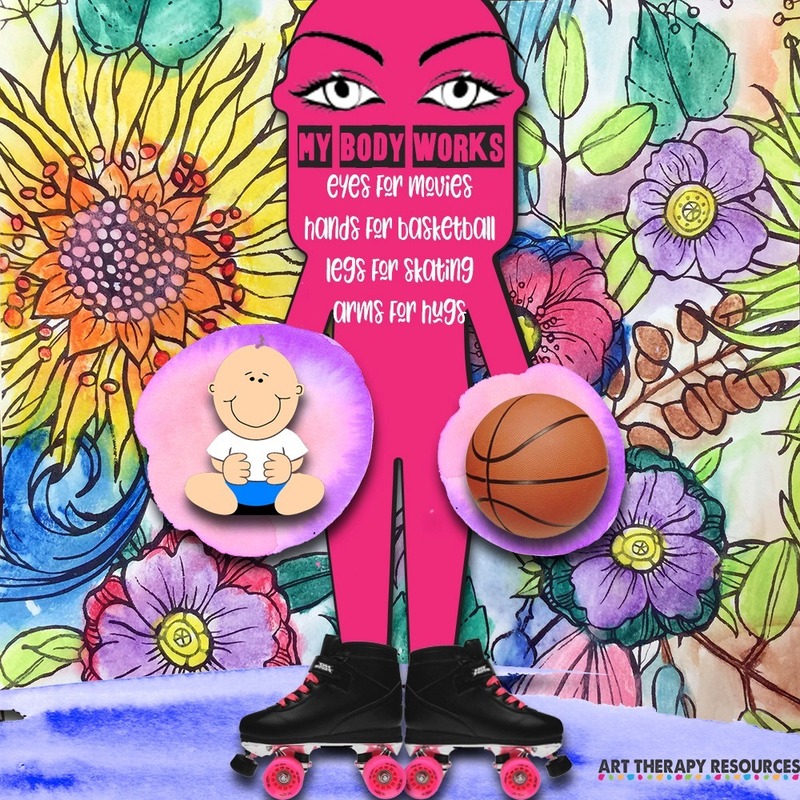 As Sophia created her artwork and labeled the various physical functions of the body, she could see the body is useful for lifting, walking, jumping, sleeping, holding, hugging, laughing, thinking and more. Sophia noted that a beautiful body was not required to enjoy any of these things in her life.